Bedmap2 is a collection of three datasets—surface elevation, ice thickness and bedrock topography. 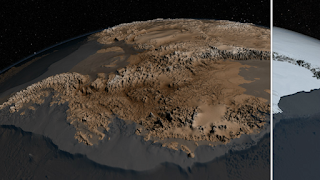 Bedmap2 is a significant improvement on the previous collection of Antarctic data—known as Bedmap—that was produced more than 10 years ago. The product was a result of work led by the British Antarctic Survey, where researchers compiled decades worth of geophysical measurements, such as surface elevation measurements from NASA's Ice, Cloud and Land Elevation Satellite, known as ICESat, and ice thickness data collected by Operation IceBridge.